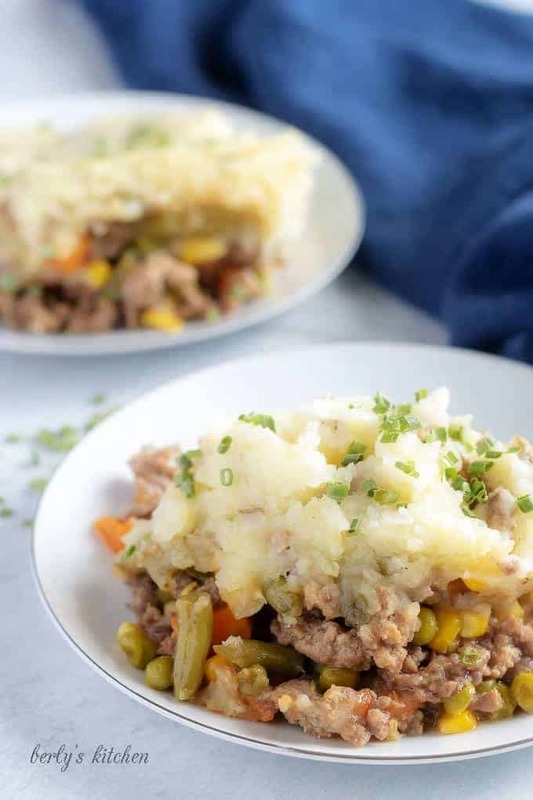 A non-traditional shepherd’s pie made with simple ingredients and a mixture of beef and lamb. It’s loaded with veggies and topped with mashed potatoes. 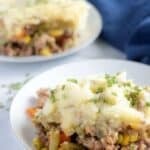 I know it’s not St. Patrick’s Day, but a good shepherd’s pie can still be a delicious Fall or Winter dish. 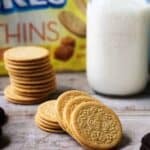 This recipe has been in my cooking routine for a long time. However, I was hesitant to share it because it’s not really authentic. It’s just something I throw together when the temperatures start to plummet. In fact, it’s more of casserole than a pie. Despite its lack of authenticity, it still manages to be a warm, comforting dish that almost everyone in the household enjoys. For that reason, I felt I had to share it. Now, I will say, while this shepherd’s pie is delicious, it’s not exactly simple to prepare. Well, let me rephrase that, it’s easy to make but has a lot of steps and takes about 2-hours from start to finish. The recipe is not one of those “throw together after work,” kinds of dishes that we usually post. 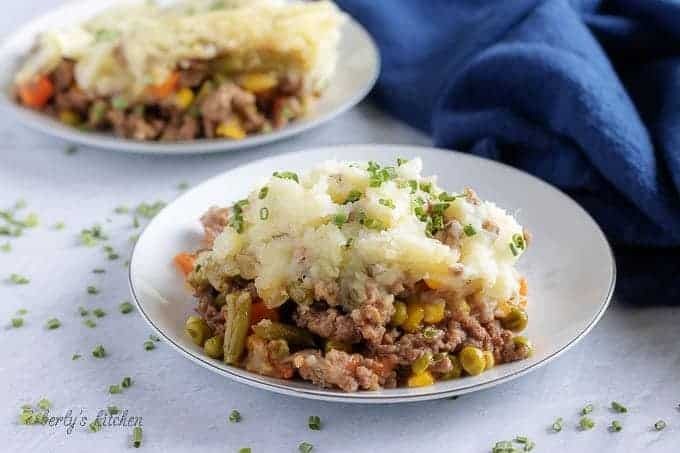 The shepherd’s pie takes time and some effort, so I would save this one for a lazy weekend when you feel like making it. In spite of the kitchen time, I feel you’ll be rewarded for your efforts. As always, I will provide tips below to help you cut down on the work. Let’s get rolling! Before we get down to business, I recommend doing a little prep work first. Go ahead and dice your potatoes and white onions. On a side note, it’s up to you whether or not to peel the taters. Personally, I leave the skins on because peeling takes time. Also, one way to ensure your family knows you used real potatoes is leave the skins in the mashed topping. Speaking of the mashed taters, that’s the first step in this shepherd’s pie bake. First, dice your potatoes, if you haven’t already, and place them into a large saucepan or stock pot. Add just enough tap water to cover them in an inch of cold water. Next, over medium-high heat, bring the potatoes to a boil and let them continue boiling until they are fork tender. This should only take 10-15 minutes once the water reaches a rolling boil. Then, once the taters are done, drain them and put them into a large mixing bowl. Now, add the milk, butter, salt, and pepper. Last, mash them up until they reach your desired consistency. At this point, carefully taste the hot potatoes to see if they need more salt and pepper. Remember, your cooking this dish your tastes, not mine. That means, adding or reducing spices as you see fit. After you’ve made sure you like the flavor and texture, set the mashed potatoes aside. First, in a 7-quart dutch oven or large saucepan or stock pot, combine the ground beef, ground lamb, diced onion, sea salt, black pepper, garlic powder, onion powder, paprika, and dried thyme. Turn the heat on to medium and start sauteing the ingredients. You’ll want to stir everything together, otherwise, it will stick and the spices will burn. Next, continue cooking the mixture, while stirring, for about 10-15 minutes or until the onions have softened and the meat is browned. It’s time to add the Worcestershire sauce to the mix. 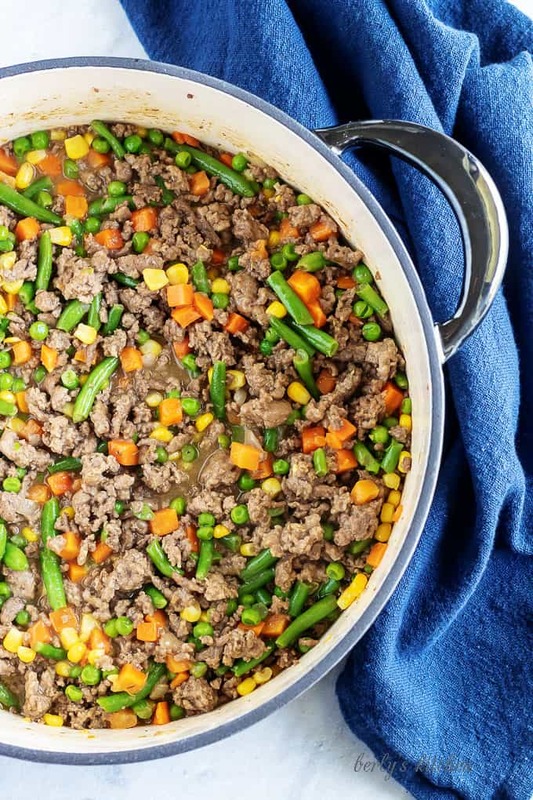 Once again, keep stirring to get that savory flavor into the shepherd’s pie filling. Afterward, dump in the frozen veggies and guess what, keep stirring. Let the filling cook for another 7-10 minutes so the frozen veggies cook down a little. Between stirs, preheat your oven to 425 degrees F.
Tired yet? Hang in there, we’re over halfway done. You can reduce the heat if needed for this step. Melt the butter in your microwave or in a small pan on the stove top. Whisk in the flour to create a simple thickening agent for your shepherd’s pie. Then, pour the butter and flour mixture into the filling while stirring the dish. Now, add the beef stock to the meat and veggies and give everything one final stirring session to combine all the ingredients. Last, remove the filling from the heat, it’s time for assembly. First off, here’s where a dutch oven comes in handy because, if you’re using one, then you don’t have to do anything else but top the meat and bake. On the other hand, if not, then you’re going to have to transfer the filling to a 9×13-inch baking dish. 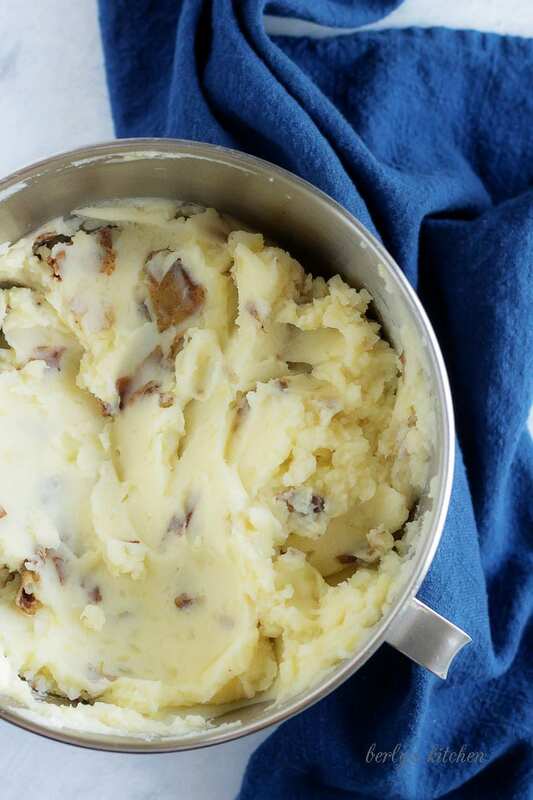 Next, start topping the shepherd’s pie filling with our mashed potatoes. There are a couple ways of doing this, a simple spoon, plastic spatula, or even a decorating tool for real pizzazz. For me, I just used a rubber spatula and smoothed out the taters. The main thing, is that you cover all of the filling with thick layer of creamy mashed potatoes. Once the filling is covered, place the dish of your choice, into your preheated oven and bake at 425 degrees F. for 30-35 minutes or until the potatoes start to brown. Last, remove the shepherd’s pie from the oven and set it out to cool for about 20 minutes before serving. That’s it, garnish each serving with chives or green onions and you’re good to go! For starters, you could use boxed mashed potatoes to cut down on cooking time. Additionally, if you want to use real potatoes but hate mashing, then try using a hand mixer or stand mixer for that step. It will definitely shorten the time and if nothing else, save your arms the trouble. Instead of using melted butter and flour, try using a cornstarch slurry. With that being said, I’ve never done that before so I don’t know the exact amounts. I would start with a tablespoon of cornstarch and 2 tablespoons of water at time until you get the best results. Try pulling out the frozen veggies an hour before you start to give them time to un-thaw, that will cut down on the cooking time for them. Looking for more comforting Winter recipes? Then take a look at our Instant Pot Pork Chops with Mushroom Gravy or our Cheesy Ground Turkey Stuffed Peppers! 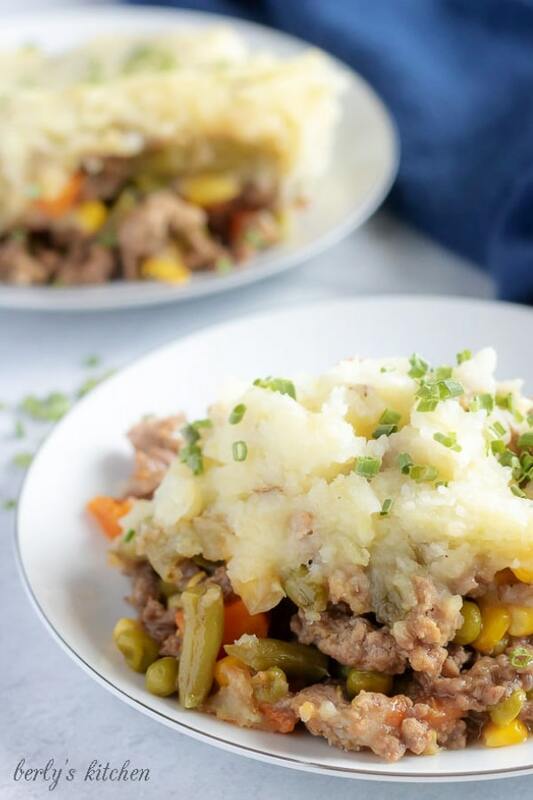 A non-traditional shepherd's pie made with simple ingredients and a mixture of beef and lamb. It's loaded with veggies and topped with mashed potatoes. First, start by dicing the potatoes (peeling optional). Next, in large saucepan, add the potatoes and add enough tap water to cover them. Then, over medium-high heat, boil the potatoes until they are fork tender (10-15 minutes). After that, drain them, and transfer them to a large mixing bowl. Last, add the milk, butter, salt, and pepper. Mash them until they are your desired consistency. Set them aside. First, in a large saucepan or 7-quart dutch oven, over medium heat, combine the ground beef, lamb, onion, salt, pepper, onion powder, garlic powder, paprika, and thyme. Next, saute the ingredients for 10-15 minutes (while stirring), or until the meat is browned. Add the Worcestershire Sauce and stir to mix. After the meat is cooked, add the mixed veggies, and saute for an additional 7-10 minutes. 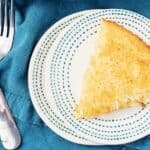 Go ahead and preheat your oven to 425 degrees F.
Now, melt your butter in your microwave or on the stove top, and whisk in the flour to create a simple thickening agent. Afterwards, add the butter/flour mixture to the meat and veggies while stirring. Pour in the broth and continue mixing the filling for another 2 minutes. Turn off the heat for assembly. First, grab a 9x13-inch baking dish or just use the dutch oven and start topping the filling with the mashed potatoes using a spatula or spoon. Next, smooth out the topping or leave it rustic. Just make sure the pie is totally covered with mashed potatoes. Then, place the dish in your preheated oven (425 degrees F.) and let it bake for 25 to 35 minutes. Last, remove the finished shepherd's pie from the oven and let it cool for about 20 minutes before serving. Top with chives or sliced green onions and serve. The calories listed are an approximation based on the ingredients and a serving size of about 1-cup and does not include the chive garnish. Actual calories will vary. 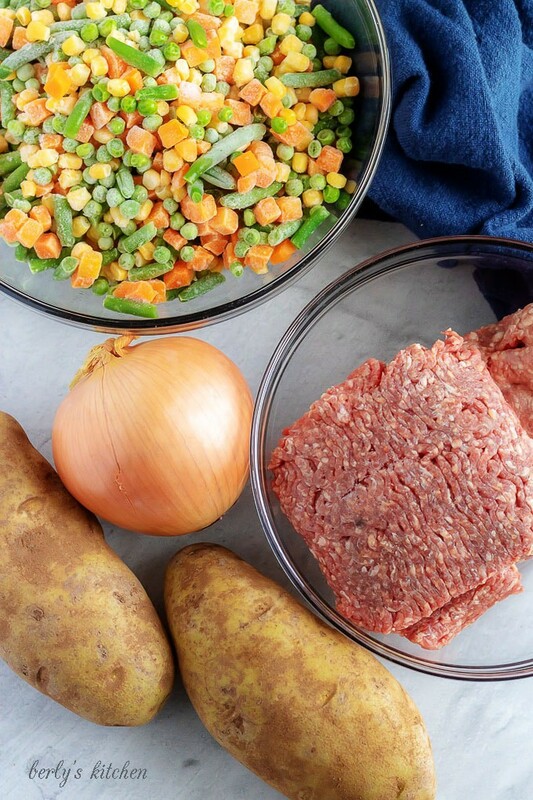 The shepherd's pie can be stored in your fridge in a sealed container for up to 3-days.